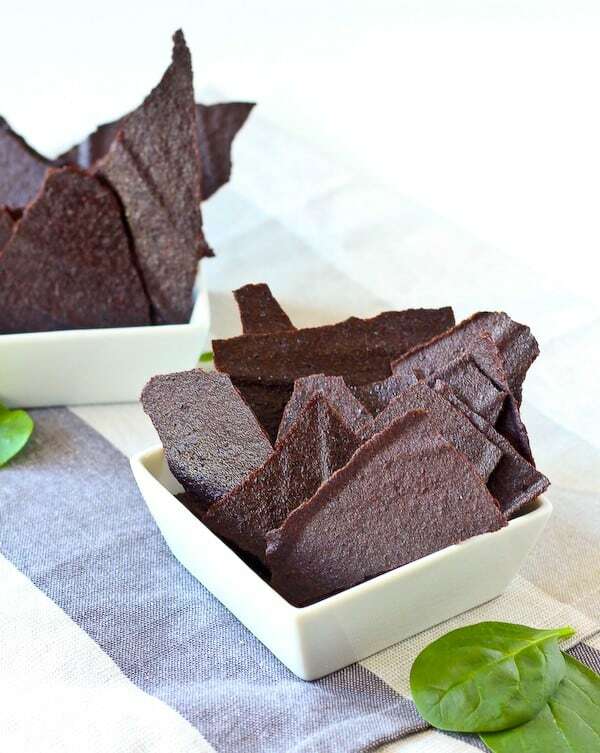 These fun homemade fruit chips are a fun, healthy snack (kids love them!). Major bonus: They hide a ton of spinach! Alright, truth time. 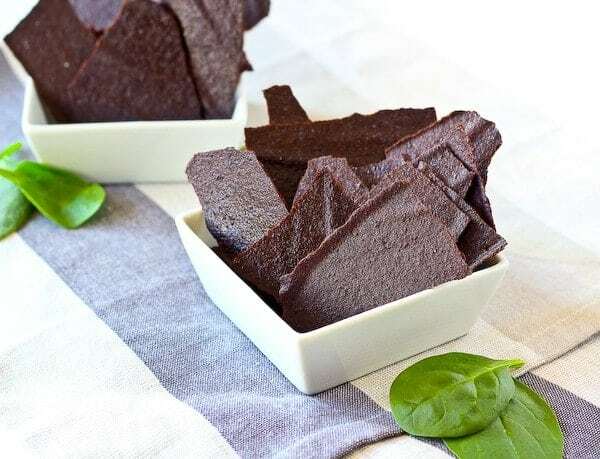 When I made these the first time, my goal was fruit leather. Out of the oven came these crispy little guys. Whoops. But then I tried one and I loved them. They’re crunchy, but at the same time, they melt in your mouth. And the best part is, they’re made from apples, blueberries, and spinach. I sent a bunch of these to my neighbor’s house and she said her 2-year-old cried when they were gone! Replace the toddler fruit melts you buy at the store with these fun chips. They’re kid-friendly, fun, and oddly addicting. They are also ridiculously easy to make. Blend everything together, pour on a parchment lined baking sheet and bake. They need to bake for quite awhile, but it’s totally hands-off aside from checking on them once or twice. 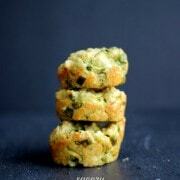 These fun little guys are my contribution to a ebook full of green smoothie recipes! You guys, this cookbook is SO gorgeous and the ideas are out of this world! 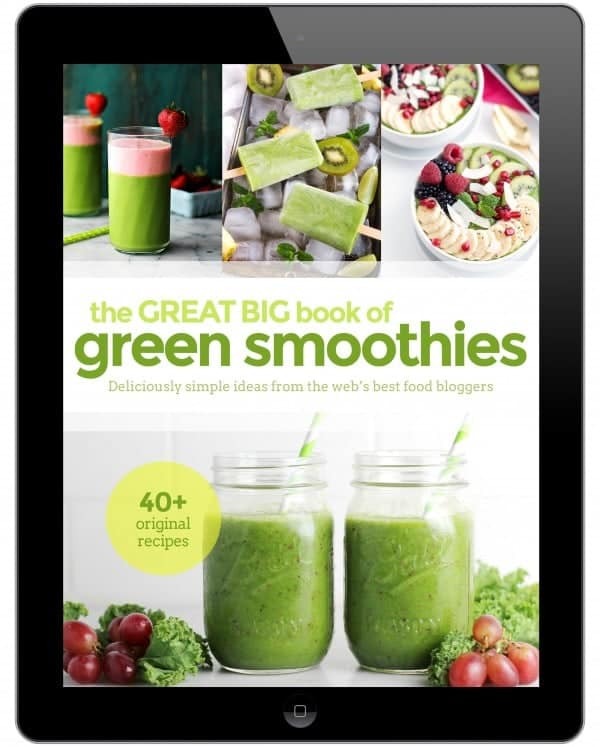 The Great Big Book of Green Smoothies is just $3 for this week only. Not only do you get 45 AMAZING recipes, but you’ll also receive a FREE 7-Day Green Smoothie Detox and our 30-Day Challenge printable. Hurry! The $3 Offer ends Sunday, March 6 at 11:59PM EST! Don’t miss out on this phenomenal deal! 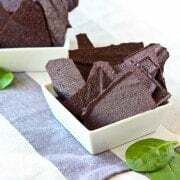 In the meantime, here’s the recipe for the homemade fruit chips. Enjoy! Preheat oven to 140 degrees Fahrenheit. Line a rimmed baking sheet with parchment paper and set aside. Spread mixture onto pan and tap on the counter to even it out and release bubbles. Place in oven and bake for 8-9 hours, rotating every 2-3 hours. Bake until no longer sticky and shiny. Cool completely before breaking into pieces and storing in an airtight container. Verdict: These were so addicting and tasty! Husband’s take: He loved these and when he found out how healthy they were, he loved them even more. Changes I would make: None are necessary, but if you want, I think you could cut out the honey to reduce sugar in these. Especially if you have blueberries that are particularly sweet. What if your oven doesn’t go that low? So yummy yummy. Thanks for your share. 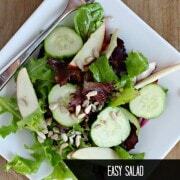 I dislike spinach but I know I should eat it because of its nutritional value….this is the perfect recipe for me. I am also going to try it out of strawberries and raspberries. I bet it would be great with strawberries and raspberries! Hope you love it. Thinking of making this for a vegan fundraiser, is honey not considered vegan? Thanks. Honey is not considered vegan. I haven’t tested the recipes this way, but I think you could use maple syrup or even just granulated sugar. 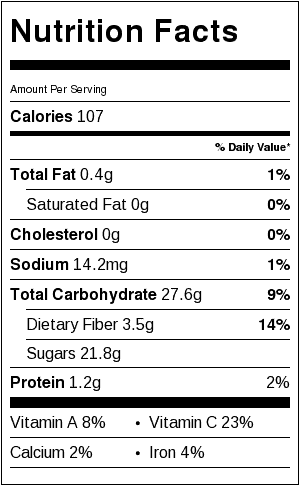 Depending on how sweet your berries are, you could potentially omit the sweetener all together. What a clever idea! I am wondering if adding similar spices&herbs as in combined fruit and veg smoothies would work for the chips too. I mean adding ground cinnamon, fresh mint leaves or ginger? Rachel, what do you think? I think that would absolutely work, and be delicious! These are brilliant! I’m going to try this in my food dehydrator. I love how you inadvertently invented something so awesome and healthy. Ha ha that her 2 year old cried when they were all gone. Love that! 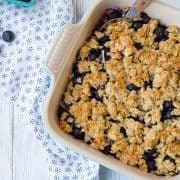 I’m so in love with this kiddo recipe!